Intel has been mostly stoic as far as its lineup goes, but a rumor that stems from Bitsandchips.it, a publication that has proved to be fairly reliable in the past, suggests that the company might be taking the high road to tackling Ryzen. It has already promised to include 10 core Skylake variants in its high end lineup (Skylake-X) but if this report is true then it means we could be looking at a massive, 12 core/24 thread die as well. Since the source has marked this post as rumor, I would recommend taking this one with a grain of salt. That said, this wouldn’t be something that is unusual or even something that we would not expect Intel to do. Intel has lost the core for core advantage that it has held in the past, and the answer to that might be to scale up its core count. Here is where things get very interesting though. Assuming Intel is actually preparing a 12 core variant to include in the Skylake-X lineup then that means that you are actually looking at a lineup shakeup. instead of the 6, 8 core high end parts, we will be looking at 6, 8, 10 and 12 core parts. There is also one very obvious implication in all this, that Intel will be cutting prices for the price points across the board as well. Microcenter has already started cutting prices, but as of yet there is no word from Intel on an official price cut. It is possible that Intel will introduce the new set of price cuts with the new Skylake-X lineup and has currently adopted a wait-and-see strategy, which would make a lot of sense. The Skylake-X and Kaby Lake-X processors will launch at Gamescom 2017 which will take place in Cologne, Germany. The launch lineup will include at least four SKUs that will make their way to the X299 platform. All processors will utilize the 14nm process node, however, the Kaby Lake-X chips may have a slight edge due to the process optimizations. This would result in better clock speeds with reduced power consumption, adding to the efficiency. The four SKUs will include a 10 core, 8 core, 6 core and 4 core model. The 10, 8 and 6 core models will be based on Skylake architecture. The 4 core model will be based on the Kaby Lake architecture which launched on mainstream platforms earlier this month. All Skylake-X chips will feature a rated TDP of 140W while the Kaby Lake-X chip will feature a TDP of 112W. All chips will be marketed as the Core i7-7000 series processors. There are certain caveats associated with this report as well, one I feel obliged to mention. 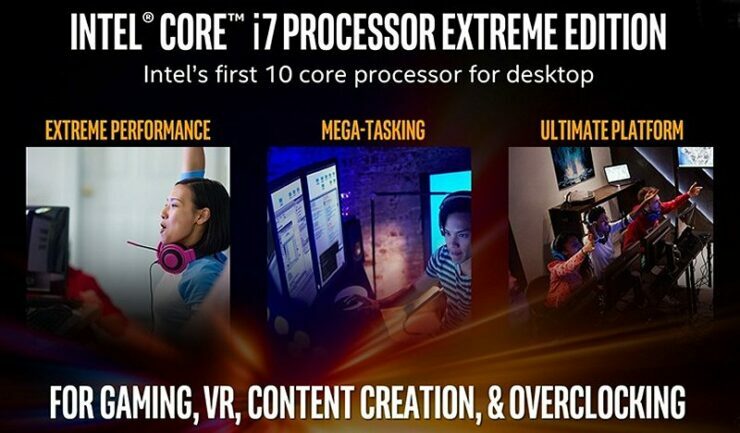 Intel already has a 12 core CPU of-course, but that isn’t part of the mainstream lineup or even HEDT. If the 12 core CPU is to go commercial, it would have to be brought down to the Intel enthusiast class socket (LGA 2066) and that would require a few months at the very least, if Intel gives it an all-out effort. That is, assuming the 12-core in question is reactionary in nature to Ryzen and hasn’t already been prepared as a contingency measure. Secondly, unlike before, AMD actually has the option to simply do the same. With the highly scalable nature of Zen architecture and large processors like Naples in the pipeline, AMD can easily copy Intel’s strategy and introduce a 12 core processor as well (it can even harvest the Naples 2S145A4VIHE4_29/14_N, 16 C dies that did not make the cut due to yield) into its mainstream market. This dilemma (a textbook example of game theory) means that it might not be a good idea for Intel to escalate the stakes with no guaranteed return. Regardless of whether Intel goes forward with this, one thing is for sure, it will need to eventually respond to Ryzen and halfhearted attempts at immaterial price cuts will simply not do. A HEDT shakeup will allow Intel to keep on charging a premium for core counts AMD does not match in the mainstream while price matching (approximately) similar core SKUs to AMD’s pricing levels.